Nishi Enterprise is a proud manufacturer of top quality spur gears that are equipped with straight teeth that are cut on rim, running parallel to axis of rotation. Our Spur Gears are known to be robust and cost effective and used extensively for diverse applications. With our Spur Gears, it is possible to transmit power and motion between the parallel shafts that rotate on the opposite directions. Our spur Gears come in the forms of cylindrical disks that have radially projecting teeth with straight edges that are parallelly aligned to axis of the rotation. These gears are mounted over parallel shafts in a way that the teeth are able to mesh together and effectively transfer power and motion. 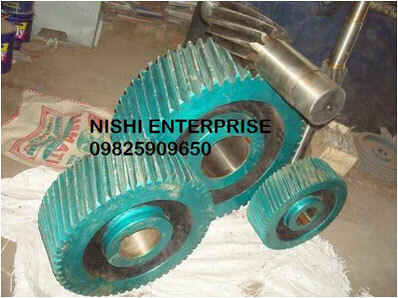 We at Nishi Enterprise have served as leading designer and manufacturer of top grade spur gears for many decades. Our state of the art spur gears are always crafted with the help of top quality raw materials that are processed and shaped into high yield spur gears. We also coat our products with a finishing material once they are done so that they remain protected from corrosion, wearing and tearing for a long time. We subject our spur gears to extensive testing so as to make sure that they deliver the best quality performance for the uses that you have in mind. The high end designing of our spur gears makes them extremely user friendly and can be implemented in a wide range of applications that require high load and high speed. The spur gears are also perfect for applications that require varying ranges of high and low speeds. They are used in all kinds of gear trains as well as in numerous velocity ratios. The spur gears are most suited to effectively multiply the power or torque of a particular object or for increasing or decreasing the overall speed of a specific object. We create custom and standard spur gears for a wide range of mechanical applications such as electric screwdrivers; clocks and household appliances like blenders, washing machines, oscillating sprinklers and clothes dryers. We also make spur gears for bicycles, railway trains and aircraft engines. If you are looking for high torque and low speed spur gears for kilns, sugar mills and ball mills, we can provide you with them as well. Our products are regularly used in numerous power stations for converting hydroelectric energy or wind into electrical energy.